Welcome to the first instalment of my blog! 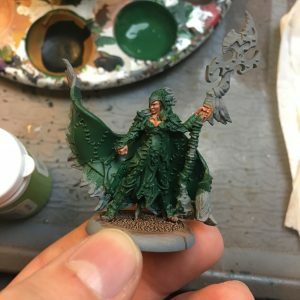 The first two articles will be about painting because I’ve been asked by a few people locally to either a) give them painting advice or b) write a blog. 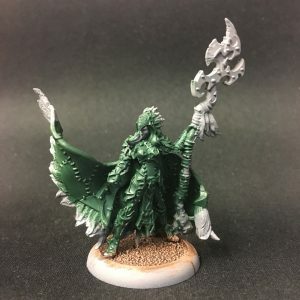 I’ve decided to kill two birds with one stone and do a painting article that will go through a model step by step rather than just showing finished models. The trouble I’ve found when verbally explaining to people techniques or styles when they ask me is that i end up explaining it and then looking at their face which usually has an expression of ‘i have no idea what you just said to me’ on it. So rather than wrestle too much with that in text form I’ve taken photos and will be able to explain it much easier with a series of images. I needed to paint Una2 in preparation for the WMH ETC in a few weeks so killing more birds with more stones (there’s a Griffon joke in there somewhere, i’m sure of it) i will be showing you what i do when i paint. I can then put them on the table and play games with them and not have to use a proxy or part-assembled model. It can hide parts of the model you don’t have to paint. During assembly i also make sure that it’s pinned if necessary and that all mould lines are cleaned up and gaps filled. Miniatures and miniature paints are pretty good for covering mistakes. If you have noticed that you missed a mould line or there’s a gap that you missed then just clean it up or fill it, no big deal. Same thing goes for accidentally getting some paint onto an area you didn’t want it on. If you catch it straight away you can sometimes wipe it off with your finger or use a clean paint brush with water on it to clean it away. Failing that it’s a simple fix usually to paint back over it. Priming you model is important, you should do it. I also like to wash my models before i assemble them. It’s not essential (unless you are using resin) but it’s now become a habit for me. It gets the mould release stuff off the metal models (the white powdery layer you get when you open the pack). I also like to prime my models with Halfords Grey Primer. I’ve tried both white and black primers but it’s grey all the way for me. The problem i have with black primer is that it can be difficult to see the detail once it’s primed as the whole model is so dark. Also light colours can require a lot of layers or that you do an initial layer with a darker colour then go to your light colour. I have a similar issue with white primer but for the darker colours where you may have to put multiple layers on to stop the white primer from showing through. Grey gives you a great middle ground between the two and it’s very easy to see the detail on the model while you are painting. Try it, it will blow your mind (or prove to be pretty good). I always do the big messy stuff first, that way you don’t have to be neat and worry about getting paint where you shouldn’t. This usually means i do the base first on models. My bases for my circle are deliberately simple so that i can get a consistent looking base across the army even when one model was based 2 years ago. Typically for my Circle i will then paint all the cloth green with a couple of thin layers of paint. I’ll get into that later one when i talk about the cloth but for now it just allows me to get the biggest base colour onto the model and not have to mess about with avoiding all the small details – just whack it on. So here she is at Step 2. I’ve done the base which will be finished at the end of the model with some tufts and leaves and I’ve also put the base colour down for the green cloth. Before i go any further and start showing photos of Una and some step by steps, i think it’s probably good at this point to explain the typical way i paint models so you can understand what follows. It’s also fairly simple. 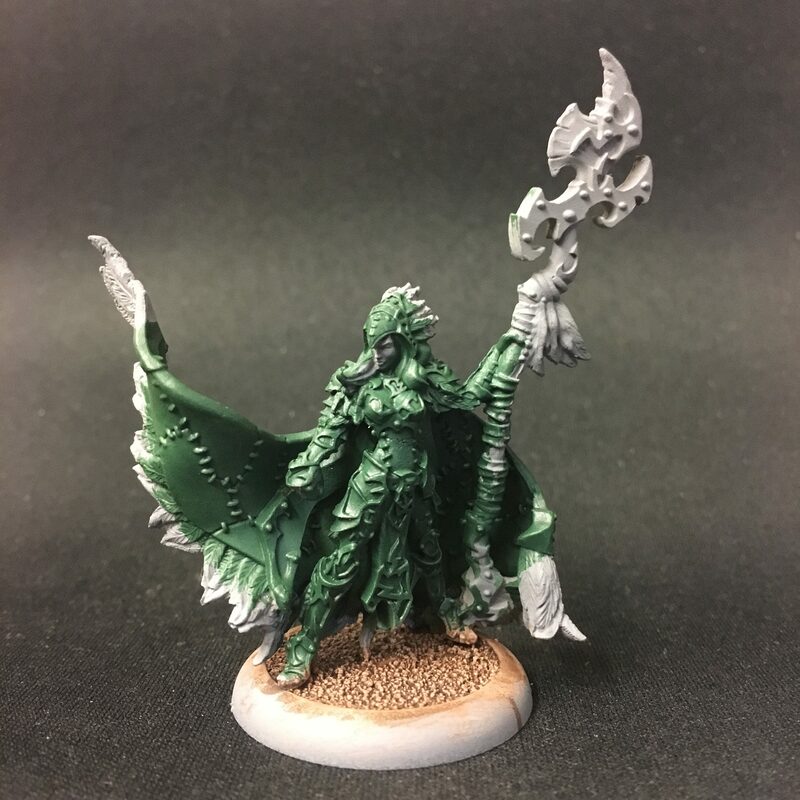 At this point i’d also like to say this is the way i paint and there are plenty of other ways to paint your models to get similar or better results, but this is an article about how i do things… so there. This gets the bright, almost cartoony, look that i get on my models. With metals it’s the same but i skip step 5 as getting more contrast on there makes them look more metallic (i’ll cover this in part 2). I’d also like to point out that i paint generally just by layering paints (sometimes will try some blending on bigger areas on important models) and to help with this you have to thin your paints. You should do that anyway, if you are using it from the pot (unless you have a good reason – and it can depend on the paint) try not to. Take your paint from the pot onto a palette, thin it with some water so it has the consistency of milk (translucent). 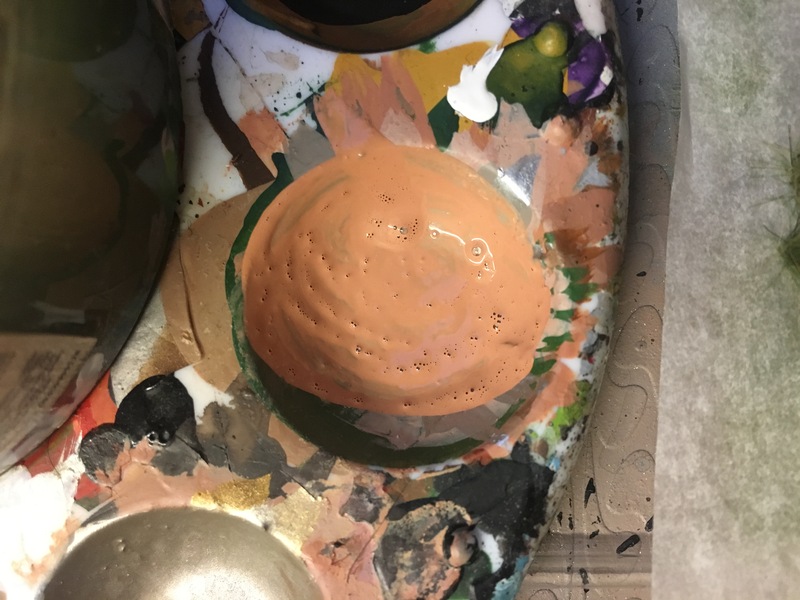 It’s hard to describe so here’s a picture of some flesh colour paint in my palette to show roughly what i’m talking about. It’s easier to paint with as the paint flows better from your brush. I also mostly use size 0 and 1 brushes. I do have a 00 brush that i use for really small details but as long as you take good care of your brushes you shouldn’t need anything much finer than those. I will always suggest to paint inside out. What i mean by that is, paint the stuff that’s on the inner-most layer of the model – usually this will be the skin. This will make things easier for you because as you progress with the model you aren’t having to avoid contacting other areas of the model when painting as you will be working ‘outwards’ in terms of layers. It’s just a quality of life suggestion for when you paint. Looking at the Una model it is clear that the bottom most layer of detail is the skin. We have the face and the hands. These would be fairly tricky to do if i had painted the surrounding areas first as i would be trying to avoid those areas with my brush. Second layer of Cadian Fleshtone. You can see how it’s now building on the first but still retaining the detail of the model. Third layer of Cadian Fleshtone and now we have a solid, consistent coating of the paint and Step 1 of my painting method is done (Base Colour). Step 2 of my painting method – wash. The skin is given all over over wash with Reikland Fleshshade. Be careful not to let the wash pool anywhere when you do this otherwise it will create really dark places that you will struggle to highlight over without it looking rubbish. I’ve added some white in with the skin tone to create a slightly lighter shade which i will use to do the same as the above but on less of the raised areas. What i’m trying to do it make the skin lighter the more raised it is, it’s highlighting (if you aren’t familiar with that term) and it’s basically how i paint my gaming standard models. I’ve now added more white and you can see here that i’ve applied it to the nose, chin, brow, top of the cheeks, jawline, the knuckles, fingertips and the lips. You can start to now see the definition on the face and hands and by using thin layers the transition is smooth and avoids the cell shaded look highlighting can have sometimes. Note – feel free at this point to go back in with the wash into the recesses to create more contrast in areas where you think it may be needed. At this point in time i went back with the Reikland Fleshshade around the nose, between the fingers and under the chin to just get a bit more depth. Also note – skin is difficult and takes practice to get looking right. Initially it will look a bit off but with practice and experimentation you will find a way you paint it that works for you and gets good results. Add more white in this time to get a good strong bright colour. This will be used as an extreme highlight (make sure it’s still thin) to really make the face ‘pop’. This will go on the nose, knuckles, neck, jawline and the brow. This step will create a good contrast between the brighter and darker areas and give the face and hands definition that can be noticed on the tabletop. This step is usually the most important. I’ve found you can be relatively messy with the previous steps but a confident sharp highlight will bring it all together and make it look much neater. This takes practice and importantly confidence in what you are doing. A steady had is nice as if the highlight is wobbly at this point it will be very noticeable. You may want to add steps into this sequence or even go further. You can also decide where to paint the highlights to create some interesting lighting effects where some of the face is darker than another etc. This method will work with all skin tones. I use the same method on my Trollbloods but substituting the skin tones for Wolf Grey (Army Painter), the wash for Blue Wash (Army Painter) and the light colour for Trollblood Highlight (P3). 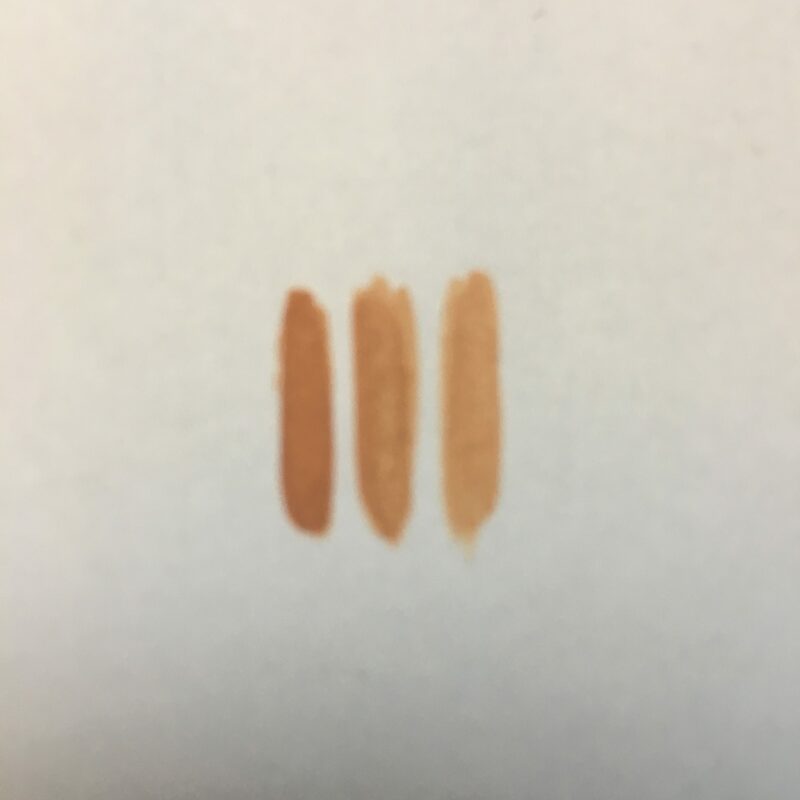 This is a comparison of the shades of skin tone I’ve used. Going from left to right we have the base colour (Cadian Fleshtone), base colour + white, base colour plus more white. There is a step after that used in image 4 above which is just adding in more white, but you can see the gradual progression in colour this creates. I hope you found this useful and if you have any questions please feel free to ask and if you have any specific requests on things i can try to find a model to paint it on and do a step by step. If you also have any feedback on what you liked or didn’t like also let me know. I understand this article has been fairly long, but thanks for sticking with it.